One of the biggest communication problems with respect to anthropogenic climate change is that for most people climate change is perceived as a threat in the future, and therefore most likely only future generations will feel the impacts. An exception to this fact are extreme weather events some of which are already being made more likely by climate change. If this causal connection can be drawn to public attention at the time, the impact of climate change could potentially be made more real and immediate in the public consciousness. Up until very recently, however only general statements about such events could be made which again did not help in getting the message across that climate change is not just a future problem. In a warming world particular types of weather events, such as heat waves and extreme rainfall, will become both more intense and more frequent with a rising mean global temperature. However, such general physical reasoning (e.g. warmer air can contain more water vapour leading to more intense and more frequent rainfall events) leaves us unable to say more than that such extreme weather events are consistent with climate change *. Furthermore, the chaotic nature of weather means that it is generally impossible to say, for any specific event, that it would not have occurred in the absence of human influence on climate. In a simple analogy, a dice may be loaded to come up six, but a six could have come up anyway without the loading. Many people therefore think that it is impossible to attribute specific extreme weather events to past gas emissions, even in principle. However, this is not the case. In the last decade a new field of research, probabilistic event attribution (PEA) has emerged, and developed the methodology to identify a human fingerprint in individual extreme weather events. The framework was introduced in 2003 by Myles Allen in Oxford and in 2004, Stott et al. published the first paper in Nature applying PEA and showing that climate change at least doubled the risk of the record-breaking European heat wave in the summer of 2003. Since then, advances in the field have prompted numerous studies, leading the Bulletin of the American Meteorological Society (BAMS) to dedicate an annual special issue to extreme event attribution for the past three years. In the probabilistic approach, possible weather under the observed climate conditions (e.g. greenhouse gas concentration, sea surface temperatures, etc.) is simulated over and over again using state-of-the-art climate models and thus obtaining statistics of weather under these conditions. At the same time possible weather is simulated under equivalent natural forcings (solar, volcanoes, etc) but with pre-industrial values of greenhouse gas concentrations in the atmosphere, hence we simulate possible weather in a world without anthropogenic climate change. Using the analogy above we roll the weather dice over and over again to obtain statistics of rolling a six. Anthropogenic climate change might have loaded the dice to increase or decrease the probability of coming up six. While we do know that for unloaded dice the probability of coming up 6 is one sixth we do not know the probabilities of extreme weather events in a world without climate change because we have never observed such a world. The approach, therefore, depends crucially on model simulations and on the model’s ability to reliably simulate the climate conditions generating the extreme weather event. So, while attributing changes in risk of extreme events, e.g. heat waves, to increasing anthropogenic greenhouse gas emissions can be done with confidence, the robustness of attribution studies of other extreme events must be assessed on a case-by-case basis. This has been done with several successful assessments on the human influence on the probability of occurrence of extreme precipitation events (Pall et al., 2011, Christidis et al., 2013, Lott et al., 2013, Schaller et al., 2014). Every extreme weather event is caused by a combination of different factors so a case-by-case analysis is necessary. However, crucially, it is now possible, using PEA, to link individual extreme weather events to their individual causes, one of which could be anthropogenic greenhouse gas emissions. For each of such attribution studies the possible outcome could be that human greenhouse gas emissions have increased the likelihood of the event, or decreased it or played no detectable role. A fourth possibility would be that our current generation of climate models is unable to reliably reproduce the event. Apart from events that fall in the latter category (e.g. tornados) PEA offers the chance, for the first time, to directly link individual weather events to anthropogenic climate change and thus to assess whether and to what extent climate change is already taking its toll. In other words, it enables us to give a quantitative estimate of how much anthropogenic climate change is costing us today. This ability could potentially have a huge impact on climate change communication. Extreme events, in particular those that are not just rare from a meteorological perspective but also lead to societal and monetary damages and interrupt everyday life usually receive a very high level of public attention. If attribution studies show that a particular event was indeed made more likely due to anthropogenic climate change, i.e. anthropogenic climate change has increased the chance of the event occurring at this point in time, human induced climate change is transformed from something that is happening at some point in the future to a real threat in the here and now. Hence, PEA can make anthropogenic climate change immediately graspable and thus invaluable to communicate the topic to the public, the press and the politicians. Currently, these studies are published well after public attention to the event has peaked. However, while the first study attributing a high precipitation event (Pall et al., 2011) to anthropogenic climate change took several years to complete, the annual Bulletins of the American Meteorological Society (Peterson et al., 2012, 2013 Herring et al., 2014) only require months to complete. By refining the methodology and crucially involving more scientists and research groups globally in event attribution, the science is advancing quickly and validation and event definition processes are now possible in very short time frames. Because a deep understanding of the relevant meteorological processes for each single event is necessary it is difficult to foresee these procedures being automated. Through a new partnership between Climate Central, a non-profit organisation providing TV weather forecasters with climate information, the University of Oxford Environmental Change Institute and other academic partners this huge communication opportunity will be taken to the next level by building a modelling and communication framework that provides decision-makers, and in particular the public, with the means to make clear the quantitative connections between greenhouse gas emissions and extreme weather events in real-time. This fast turn around ensures that any communication opportunity will have maximum impact as an extreme event only remains topical while it is unfolding. By hearing the science as the public experience the event, they will really begin to fully understand climate change. This article originally appeared in the Oxford Magazine. * Hulme 2014, “Attributing Weather Extremes to ‘Climate Change’: a Review” in Progress in Physical Geography, p. 5. (accessed July 15 2014). Allen (2003) Liability for climate change. Nature, 421:891-892. Herring, S. C., M. P. Hoerling, T. C. Peterson, and P. A. Stott, Eds., 2014: Explaining Extreme Events of 2013 from a Climate Perspective. Bull. Amer. Meteor. Soc., 95 (9), S1–S96. Lott, F., N. Christidis, and P. Stott (2013) Can the 2011 East African drought be attributed to anthropogenic climate change? Geophys. Res. Lett., 40, 1177-1181. Otto, F. E. L., N. Massey, G. J. van Oldenborgh, R. G. Jones, and M. R. Allen (2012) Reconciling two approaches to attribution of the 2010 Russian heat wave. Geophys. Res. Lett., 39, L04702. Pall, P., T. Aina, D.A. Stone et al. (2011), Anthropogenic greenhouse gas contribution to flood risk in England and Wales in autumn 2000, Nature, 470, 382-385. Peterson, T. C., M. P. Hoerling, P. A. Stott and S. Herring, Eds. 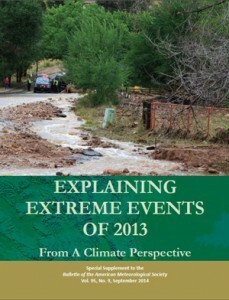 (2013) Explaining Extreme Events of 2012 from a Climate Perspective. Bull. Amer. Meteor. Soc., 94 (9), S1–S74. Peterson, T. C., P. A. Stott and S. Herring, Eds. (2012) Explaining Extreme Events of 2011 from a Climate Perspective. Bull. Amer. Meteor. Soc., 93 (7), S1–S74. Schaller, N., F. Otto, G.J. van Oldenborgh, N Massey, S. Sparrow (2014) The heavy precipitation event of May-June 2013 in the upper Danube and Elbe basins [in “Explaining Extremes of 2013 from a Climate Perspective”]. Bull. Amer. Meteor. Soc., 95 (9), S69–S72.